Protestors gathered outside the Rugby Town Hall on Tuesday to protest against the latest draft of the Local Plan. Angry residents in Woodlands, Hillside, Rokeby and Dunchurch have joined forces to oppose Rugby Borough Council’s latest draft Local Plan. The newly-formed group –which has given itself the temporary name About Turn – came together in force to protest outside Rugby Town Hall on Tuesday evening. 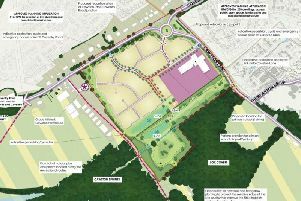 As reported in the Advertiser last week, the council has published its revised draft plan, which includes the controversial housing between Bilton/Cawston and Dunchurch – and new proposals including a garden village of 1,500 houses off the A45 near Grandborough. About Turn is one of a number of Rugby area groups fighting housing plans. Richard Allanach, one of the About Turn members, said: “At the moment the council has a half-baked plan which lacks even a map showing what it proposes. With 26 councillors in favour, the motion to go to consultation was carried - but there was some strong opposition in the room. The seven Liberal Democrats in attendance abstained from the vote after their proposed amendments were turned down. Independent councillors Howard Roberts and Deepah Roberts, who both represent Dunsmore ward, voted against the motion. Cllr Howard Roberts said after the meeting: “The proposed plan will clearly place additional pressure onto Rugby’s already creaking infrastructure. “It is clear that the quality of life for existing residents will be negatively impacted; this makes the plan unacceptable by this fact alone. “There is great irreversible harm associated with adoption of a Local Plan based on an unrealistically high housing-need figure. The public consultation period will be held from Monday, September 26 to Friday, November 11.